Author: Grant, L. M. & Harris, B. Sr. 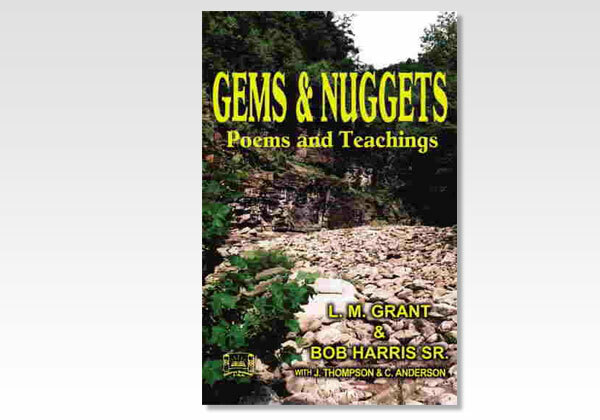 The poems or Gems by Leslie M. Grant, have never been published in book form. These poems express his love for the Lord and His people, and will refresh your spirit. Leslie M. Grant lives in the Seattle, Washington area and has served the Lord in full time service for over 65 years. He has written a number of books and Bible commentaries, available through Believers Bookshelf, Inc.
Bob Harris was born in Carthage, NC on Nov. 30, 1919, and born again in 1947. Soon after, he began to fellowship with a local assembly in Baltimore, MD, and later in life in New Freedom, PA. Brother Bob greatly valued the older brethren ministry, both oral and written. The Lord gave him a special gift of being able to take the things he had gleaned and to share them in his own unique way. Often the Lord's people would come to him after ministry to thank him for another nugget. This book contains some of these nuggets.